Seven years ago today, I published my first post on MacStories. I had no idea back then that this website would become my job one day – in fact, I really had no idea what I was doing. Every day, I'm incredibly thankful for the luck and privilege to have found friends, colleagues, and an audience that have guided us with their honest advice, help, and daily support. MacStories wouldn't be possible without you. To celebrate the occasion, I'm thrilled to announce two changes that I think are going to make the MacStories experience more enjoyable for everyone. 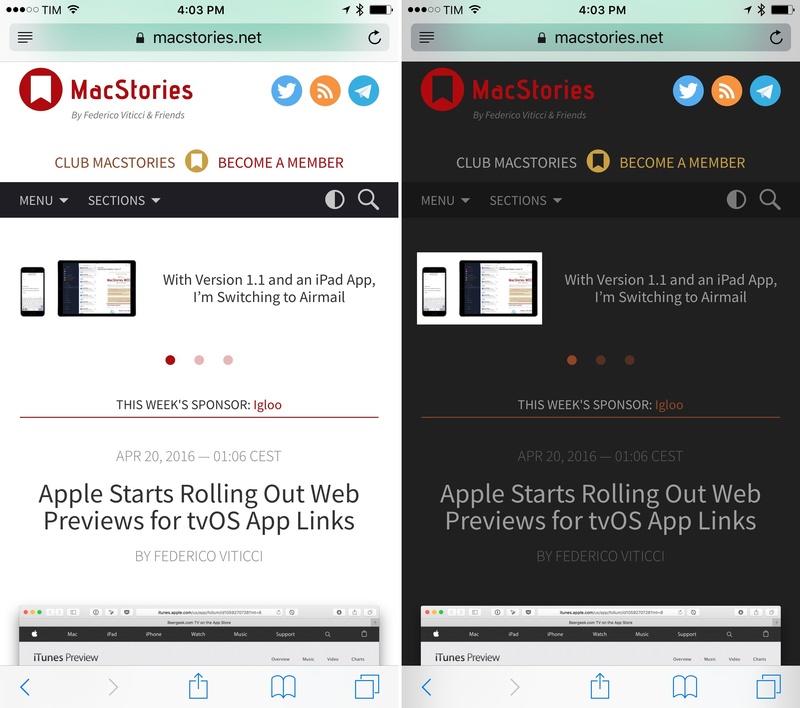 First up, we're introducing a dark theme for MacStories today. I've been thinking about the benefits of a dark reading experience for the past few months. Several readers got in touch with us over the years, requesting the ability to switch from a traditional black text on white background to a darker reading environment. There are considerable legibility benefits to a dark theme: some people find the increased contrast between background color and text helpful when reading longform articles – one of the aspects we've become known for – while others find dark themes more pleasing on the eyes at night, when they're relaxing after a long day and want to catch up on what we've published. 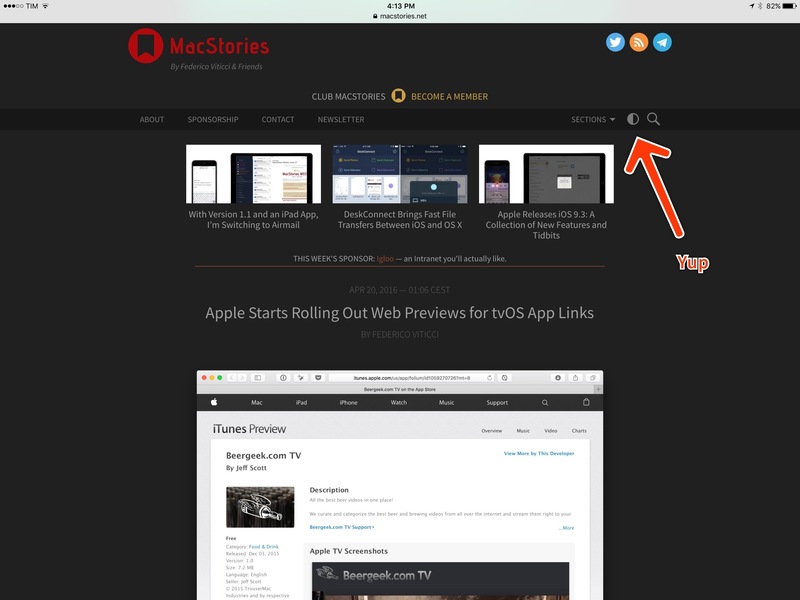 Starting today, you'll find a new button in the top site toolbar to toggle MacStories' new dark theme. Despite the different look, every site feature is where you expect it to be: footnotes still appear as popovers inline, hyperlinks are underlined, and you can navigate long articles with pagination and Table of Contents shortcuts. We've strived to find a good combination of colors with our developer Alessandro, and I personally love the way orange, dark and light grays, and images coexist in the dark theme. However, I also know we can always do better: if you find something that doesn't quite look okay in the dark theme, or if you think it could be more accessible, or if you spot any bugs, feel free to get in touch. I take the reading experience of MacStories seriously, and I'd love to hear from readers with different tastes and needs to improve our layout and legibility. Second – and you may have seen this on Twitter or heard about it on Connected recently – we've opened a Telegram channel where you can follow the "behind the scenes" adventures of the MacStories team. You can find it here, and you can follow it from any platform as long as there's a Telegram app for it. I've been keeping an eye on Telegram lately – what started as an alternative to WhatsApp has evolved into a powerful ecosystem of apps, bots, and channels that make it easy to stay in touch and follow your interests. I've been increasingly switching all my personal communications to Telegram – the fact that it's also on the iPad and that it supports custom stickers and /slash commands sold it for me. And when I understood how channels worked and what could be done with the MacStories team, I was interested to see how that could become another venue for our readers to stay up to date on what we're working on in a more direct, personal way. 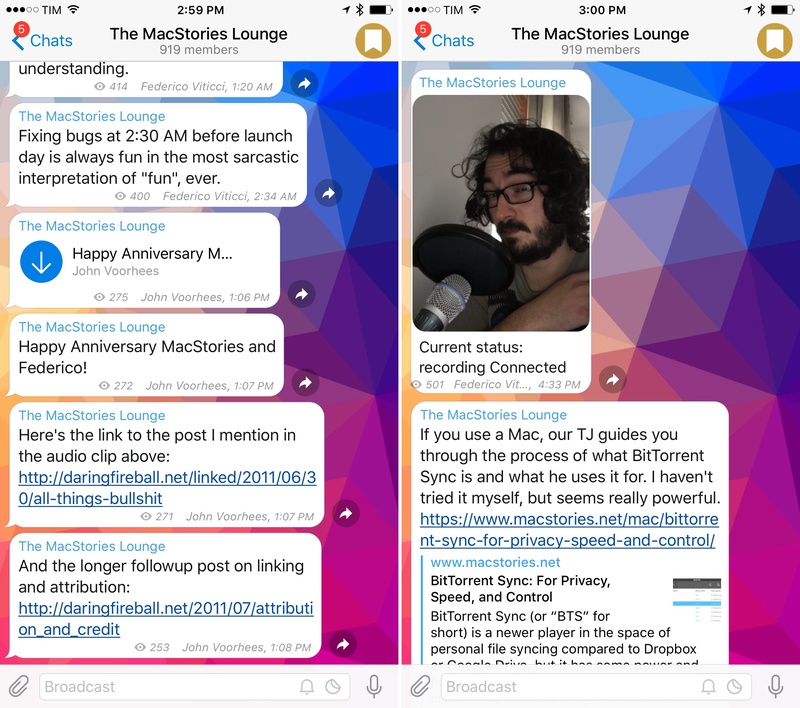 The channel is called The MacStories Lounge, and it already has over 900 members. Unlike groups, channels don't allow member interactions – it's not like a public forum, or a thread where everyone can post. I'm still thinking about solutions we could explore to have a community for Club MacStories members. In the meantime, though, I wanted to have a place – sort of like an extended, unedited Twitter – where we could post longer messages, photos, audio clips, silly selfies and GIFs, and show sneak peeks of upcoming content to a more dedicated audience. We've been having lots of fun with Telegram (you can listen to some examples of the daily audio clips we post – they're like mini voice journals) and I'd love for you to join the channel. We've got lots more in store. Once again: I'd like to thank everyone for reading and supporting MacStories through the years. This site – and now, Club MacStories as well – wouldn't be nearly as rewarding and challenging without an amazing, loyal community of readers and friends from around the world. You make my dream job possible every day, and I look forward to the next 7 years.